Received: June 7, 2017; Revised: June 30, 2017; Accepted: July 18, 2017; Published online: September 30, 2017. Rituximab (RTX) can be used as a rescue therapy for steroid-dependent nephrotic syndrome (SDNS). However, the efficacy and safety of long-term, repeated use of RTX are not established. This study was conducted to assess the efficacy and safety of long-term, repeated RTX treatment in children. Eighteen consecutive child patients with SDNS who were treated with three or more cycles of RTX for one year or longer were recruited, and their medical records were retrospectively reviewed. The patients were followed for 4.7 ± 1.9 years and received 5.2 ± 2.3 cycles of RTX over 2.8 ± 1.1 years. Approximately 70% of the additional RTX cycles were administered due to recovery of B-cells without relapse. The relapse rate decreased from 3.4 ± 2.0 per year initially to 0.4 ± 0.8 per year at the third year after RTX treatment. Approximately 10% of the RTX infusions were accompanied by mild infusion reactions. Eight patients showed sustained remission without any oral medication after the last cycle of RTX, while 10 patients had one or more episodes of relapse after the last cycle of RTX. The relapse rate in the latter group decreased from 2.8 ± 1.5 per year before RTX treatment to 1.3 ± 0.8 per year after cessation of RTX treatment. No significant differences in clinical parameters were found between the two groups. This retrospective study showed that pre-emptive and long-term, repeated RTX treatment is relatively effective and safe in children with SDNS. However, well-designed prospective studies are needed to confirm these findings. Oral corticosteroid treatment is the cornerstone therapy for idiopathic nephrotic syndrome (NS) in children because it can induce complete remission in the majority of cases within a month. However, relapse is common, and resumption of corticosteroid therapy is necessary in most cases . For those with a frequently relapsing course or steroid-dependent NS (SDNS), second-line treatment with cyclophosphamide, calcineurin inhibitors (CNI), and mycophenolate mofetil (MMF) is indicated to maintain remission and reduce the dose of steroids . Although these treatments are usually effective in most patients with SDNS, many patients experience recurrence of proteinuria or NS after medications are discontinued. Furthermore, these second-line drugs have their own adverse effects including leukopenia (cyclophosphamide), nephrotoxicity (CNI), and gastrointestinal upset (MMF). Recently, rituximab (RTX), an anti-CD20 monoclonal antibody, has been introduced as an effective treatment option for patients with SDNS or CNI-dependent NS [3–13]. RTX was originally developed to eliminate B lymphocytes in the treatment of non-Hodgkin’s lymphoma. Subsequently, its clinical application was extended to auto-immune diseases, such as rheumatoid arthritis, systemic lupus erythematosus, and vasculitis, as well as NS. The reported efficacy and safety of a single dose or one cycle of RTX in SDNS is promising. However, RTX treatment does not cure the disease, and most patients relapse within several months following RTX treatment [3–13]. Therefore, modifications in the RTX treatment protocol may be necessary, including applying adjunct immunosuppressive therapies and repeated cycles of RTX at regular intervals, in order to obtain long-lasting remission or a cure [14,15]. However, long-term RTX therapy can only be applied if its safety in long-term use is established. Currently, few studies on the efficacy and safety of repeated use of RTX are available [3,4,8–13], and only one of these studies  included patients treated with more than five cycles of RTX. Here, we report our experience regarding long-term, repeat RTX therapy in children with SDNS or CNI-dependent NS who were treated with an average of 5.2 ± 2.3 (range, 3–12) cycles of RTX. This study was approved by the Seoul National University Hospital Institutional Review Board (No. 0812-002-264). Informed consent was obtained from all individual participants included in this study or their parents. A total of 18 children (male to female ratio, 13:5) with SDNS, who were managed with long-term, repeated RTX treatment between 2006 and 2015 in the Department of Pediatrics at Seoul National University Children’s Hospital, Seoul, Korea, were included in this study. Their clinical courses were retrospectively reviewed. Four patients were subjects of clinical trials (clinicaltrials.gov No. D-0009-NC, D-0021-NC, D-0035-NC, and D-0027-NC) for evaluating the efficacy and safety of single-cycle RTX treatment followed by subsequent long-term repeated RTX treatment. SDNS was defined as “two consecutive relapses during corticosteroid therapy or within 14 days after ceasing corticosteroid therapy” as described in the KDIGO (Kidney Disease: Improving Global Outcomes) guidelines , and long-term repeated RTX treatment was defined as “three or more consecutive cycles of RTX treatment for one year or longer”. RTX treatment was started after induction of remission with a full dose of oral steroids or intravenous pulsed methylprednisolone with or without CNI. The first cycle of RTX treatment consisted of one to four weekly infusions of RTX (375 mg/m2 per dose, maximum 500 mg) until depletion of B lymphocytes. Then, the dosage of corticosteroids was slowly tapered by 25% per month followed by similar CNI tapering. Subsequent cycles of RTX treatment, administered in the same manner as the initial cycle, were given with parental consent upon either recovery of B-cells in peripheral blood samples or relapse of NS. B-cell depletion was defined as a CD19-positive cell count < 0.1% of the total lymphocytes. We measured a CD19-positive cell count before RTX treatment, 1 to 2 weeks after RTX treatment, and every month thereafter. If remission was maintained for more than 12 months without oral corticosteroids and CNI treatment, cessation of RTX treatment was attempted. The data are presented as either relative frequency or mean ± one standard deviation, where applicable. The continuous variables are expressed as the media and range. The paired t-test or the Wilcoxon signed-rank test was used when appropriate. A repeated-measures ANOVA was used to examine the change in variables over time. IBM SPSS Statistics software, version 22.0 (IBM Co., Armonk, NY, USA) was used for the statistical analysis. For all tests, P values < 0.05 were considered statistically significant. The mean age of patients at the onset of NS and the initial cycle of RTX treatment was 5.1 ± 3.1 years and 13.4 ± 5.4 years, respectively. The mean duration of the disease before the initial cycle of RTX treatment was 8.3 ± 3.9 years. Renal biopsy was performed in 14 patients; minimal change disease was found in nine patients and focal segmental glomerulosclerosis was found in five patients. At the time of the initial cycle of RTX treatment, all patients were on oral steroids and 16 were receiving CNI as well. In some patients, cyclophosphamide (n = 13) or MMF (n = 5) had been tried previously. 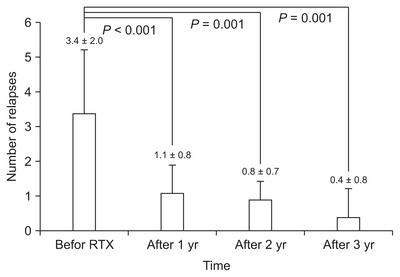 The patients were followed for 4.7 ± 1.9 years after the initial RTX treatment (Table 1). Patients received 5.2 ± 2.3 cycles (range, 3–12 cycles) of RTX with a mean interval between the cycles of 5.9 ± 0.5 months. The mean number of RTX infusions per cycle was 1.1 ± 0.4 infusions. Of the 76 additional cycles of RTX treatment given, 22 (28.9%) cycles were administered due to relapse of NS and 54 (71.1%) cycles were administered due to recovery of B-cells without relapse (Fig. 1). The mean CD19-positive B-cell count before starting RTX therapy was 16.7 ± 5.3% (range, 7.0–30.0%). B-cell depletion was maintained for 3.9 ± 1.0 months (range, 0.5–9.4 months) after each cycle. The relapse rate of NS significantly decreased from 3.4 ± 2.0 per year before RTX treatment to 0.4 ± 0.8 per year at the third year after RTX therapy (Fig. 2). All relapses occurred after recovery of CD19-positive B-cells, and the mean duration between B-cell recovery and relapse was 1.6 ± 1.4 months (range, 0.0–4.6 months). 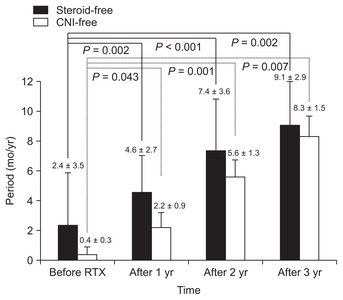 The steroid- and CNI-free periods per year before RTX treatment were 2.4 ± 3.5 months (range, 0.0–8.8 months) and 0.4 ± 0.3 months (range, 0.0–2.8 months), respectively, which increased to 9.1 ± 2.9 (range, 4.5–12.0) and 8.3 ± 1.5 (range, 3.5–12.0 months), respectively, at the third year after RTX treatment (Fig. 3). As objective indicators of steroid toxicity, the Z-scores of height, body mass index, and body weight were compared before and after RTX treatment (Fig. 4). 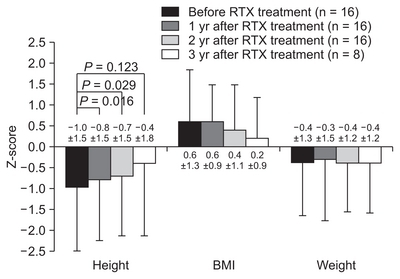 Excluding two patients who had reached their final adult heights before RTX treatment, the height Z-scores improved significantly until 2 years after RTX treatment, while the body weight and BMI Z-scores did not show significant changes (Fig. 4). The estimated glomerular filtration rate, as calculated using the Schwartz formula, was maintained within the normal range throughout the follow-up period, and hypertension disappeared during repeat RTX treatment in five of seven patients. From a total of 131 infusions of RTX performed in 18 patients, 14 infusions (10.7%) performed in 10 patients were accompanied by acute infusion reactions such as chest tightness, rash, dyspnea, fever, tachycardia, nausea, vomiting, and abdominal pain (Table 2). These infusion reactions were resolved with a reduced infusion rate and administration of antihistamine when required. Life-threatening anaphylactic reactions were not observed in any patients. Aside from infusion reactions, one patient developed Kikuchi disease seven months after the sixth cycle of RTX but recovered completely . Another patient developed a severe infusion reaction in association with the development of anti-RTX antibodies . Eight patients (Group 1) showed sustained remission without any oral medication after the last cycle of RTX treatment, and five of those patients (Patients 3–7) had remissions of more than a year at the last follow-up (Fig. 1A). Nine (Patients 9–17) of the remaining 10 patients (Group 2) had one or more episodes of relapses after the last cycle of RTX treatment. Patient 18, who maintained remission with oral medication after the last cycle of RTX treatment, was also included in Group 2 (Fig. 1B). In the Group 2 patients, the relapse rate decreased from 2.8 ± 1.5 per year before RTX treatment to 1.3 ± 0.8 per year after cessation of RTX treatment. No significant differences in the clinical parameters were found between the two groups (Table 3). Although the efficacy and safety of relatively short-term use of RTX have been proved, such treatment does not cure NS, and most patients experience a relapse within several months following RTX treatment [3–13]. Some modifications of RTX treatment may overcome these shortcomings, and two possible modifications are adjunct immunosuppressive therapy and repeated RTX cycles [14,15]. CNI or MMF may be used as adjunct therapy for the maintenance of remission following RTX treatment. A Japanese group  reported that maintenance therapy with MMF can help avoid the repeated use of RTX and may contribute to its safer use, as well as to fewer serious RTX-associated adverse events. In contrast, another Japanese group  compared cyclosporine with MMF for maintenance of SDNS remission after a single infusion of RTX and found that cyclosporine appeared to be more effective than MMF. In our study, CNI was used only in cases of relapse, and no patients received MMF at the time of initial RTX treatment or thereafter. Currently, several studies on the efficacy and safety of long-term, repeated use of RTX are available [3,4,8–13], although only one study  included patients treated with more than five cycles of RTX. In these studies, additional RTX was either administered prophylactically upon B-cell recovery or only in case of relapse. Kemper et al , in a study on RTX treatment in children with SDNS, showed that the rate of maintaining long-term remission increased from 41% to 69% by giving an additional two to four courses of RTX. Sellier-Leclerc et al  performed a study on 30 children with SDNS and concluded that RTX treatment with a 15-month B-cell depletion period induced long-term remission after definitive B-cell recovery in almost two-thirds the of the patients without the use of oral immunosuppressive drugs. In a retrospective analysis by Tellier et al , 18 children with SDNS received one to four infusions of RTX during the first course of treatment, and one to four subsequent cycles of infusions were given upon B-cell recovery (54%), relapse (41%), or systematically (5%). Such treatment with RTX resulted in sustained remission without relapse in 22% of patients and increased the duration of remission in all other patients. Although it was a retrospective study, it indicates that pre-emptive treatment at the time of B-cell recovery may help to maintain prolonged remission. Ravani et al  performed a study to assess the long-term effects of RTX, including the number of repeated infusions required to maintain remission, in 46 consecutive child patients with SDNS. The patients were treated with one to five courses of RTX during a median follow-up period of three years, and the probability of remission at 6 and 12 months after RTX treatment without the use of immunosuppressants was 48% and 20%, respectively. The use of RTX at regular intervals is another therapeutic approach, as Kimata et al  demonstrated that RTX infusion at 3-month intervals for a total of four doses was an effective strategy in maintaining remission and steroid-free periods. In a recent study by Kamei et al , 51 of 81 children with SDNS treated with RTX received additional RTX treatments for relapses and seven received more than five additional RTX treatments. In our study, the average number of RTX treatment cycles was 5.2 ± 2.3, up to 12 cycles, and 71% of the additional RTX cycles were administered due to recovery of B-cells without relapse. Such RTX treatment resulted in a sustained remission without oral drugs in eight of the 18 patients and even without RTX in five patients. In addition, in the 10 remaining patients who had one or more episodes of relapses after the last cycle of RTX treatment, the relapse rate decreased from 2.8 ± 1.5 per year before RTX treatment to 1.3 ± 0.8 per year after cessation of RTX treatment. The risk factors for relapse after repeated RTX treatment were also analyzed in several studies. Tellier et al  showed that a history of steroid-resistant NS is an independent risk factor for relapse after RTX treatment, and Sellier-Leclerc et al  showed that the risk of relapse after the discontinuation of RTX therapy was higher in patients who had already relapsed during the treatment with RTX. In the latter study, the potential role of the patient’s age in the risk of relapse after RTX treatment was also analyzed because children with idiopathic NS have a natural tendency toward a gradual decrease in the number of relapses with age . Unfortunately, the patient number in each sub-group was too small to make significant conclusions, even though patients under 10 years old tended to have a higher relapse risk after B-cell recovery. In contrast, Kemper et al  did not find any risk factors as in our study. However, in our study, the number of patients was too small for risk factor analysis. In conclusion, this retrospective study showed that pre-emptive and long-term, repeated treatment with RTX was relatively effective in children with SDNS. Such long-term, steroid-sparing effects resulted in significant improvement in the patient’s height Z-scores. However, the number of the patients and the duration of the observation were insufficient to make a conclusion that long-term, repeated use of RTX is safe and effective. Therefore, well-designed prospective studies on a larger scale are needed. This study was supported by a grant (HI12C0014) from the Korean Health Technology R&D Project, Ministry of Health & Welfare, Republic of Korea. Fig. 2. Relapse rates (mean ± 95% confidence interval) of nephrotic syndrome before and after rituximab (RTX) treatment. Fig. 3. Steroid- and calcineurin inhibitor (CNI)-free periods (mean ± 95% confidence interval) before and after rituximab (RTX) treatment. Fig. 4. Z-scores (standard deviation scores) of height, body mass index (BMI), and weight before and after rituximab (RTX) treatment. Data are presented as number only, mean ± standard deviation (interquartile range), or number (%). Data are presented as mean ± standard deviation or number only. Group 1, patients in whom remission state was maintained without oral medication after the last cycle of RTX treatment; Group 2, patients who had one or more episodes of relapses after the last cycle of RTX treatment. FSGS, focal segmental glomerulosclerosis; MCD, minimal change disease; NS, nephrotic syndrome; RTX, rituximab; Tx, treatment. Trompeter, RS, Lloyd, BW, Hicks, J, White, RH, and Cameron, JS (1985). Long-term outcome for children with minimal-change nephrotic syndrome. Lancet. 1, 368-370. Kyrieleis, HA, Löwik, MM, Pronk, I, Cruysberg, HR, Kremer, JA, Oyen, WJ, van den Heuvel, BL, Wetzels, JF, and Levtchenko, EN (2009). Long-term outcome of biopsy-proven, frequently relapsing minimal-change nephrotic syndrome in children. Clin J Am Soc Nephrol. 4, 1593-1600. Guigonis, V, Dallocchio, A, Baudouin, V, Dehennault, M, Hachon-Le Camus, C, Afanetti, M, Groothoff, J, Llanas, B, Niaudet, P, Nivet, H, Raynaud, N, Taque, S, Ronco, P, and Bouissou, F (2008). Rituximab treatment for severe steroid- or cyclosporine-dependent nephrotic syndrome: a multicentric series of 22 cases. Pediatr Nephrol. 23, 1269-1279. Kamei, K, Ito, S, Nozu, K, Fujinaga, S, Nakayama, M, Sako, M, Saito, M, Yoneko, M, and Iijima, K (2009). Single dose of rituximab for refractory steroid-dependent nephrotic syndrome in children. Pediatr Nephrol. 24, 1321-1328. Ravani, P, Magnasco, A, Edefonti, A, Murer, L, Rossi, R, Ghio, L, Benetti, E, Scozzola, F, Pasini, A, Dallera, N, Sica, F, Belingheri, M, Scolari, F, and Ghiggeri, GM (2011). Short-term effects of rituximab in children with steroid- and calcineurin-dependent nephrotic syndrome: a randomized controlled trial. Clin J Am Soc Nephrol. 6, 1308-1315. Iijima, K, Sako, M, Nozu, K, Mori, R, Tuchida, N, Kamei, K, Miura, K, Aya, K, Nakanishi, K, Ohtomo, Y, Takahashi, S, Tanaka, R, Kaito, H, Nakamura, H, Ishikura, K, Ito, S, Ohashi, Y, and Rituximab for Childhood-onset Refractory Nephrotic Syndrome (RCRNS) Study Group (2014). Rituximab for childhood-onset, complicated, frequently relapsing nephrotic syndrome or steroid-dependent nephrotic syndrome: a multicentre, double-blind, randomised, placebo-controlled trial. Lancet. 384, 1273-1281. Ravani, P, Rossi, R, Bonanni, A, Quinn, RR, Sica, F, Bodria, M, Pasini, A, Montini, G, Edefonti, A, Belingheri, M, De Giovanni, D, Barbano, G, Degl’Innocenti, L, Scolari, F, Murer, L, Reiser, J, Fornoni, A, and Ghiggeri, GM (2015). Rituximab in children with steroid-dependent nephrotic syndrome: a multicenter, open-label, noninferiority, randomized controlled trial. J Am Soc Nephrol. 26, 2259-2266. Kemper, MJ, Gellermann, J, Habbig, S, Krmar, RT, Dittrich, K, Jungraithmayr, T, Pape, L, Patzer, L, Billing, H, Weber, L, Pohl, M, Rosenthal, K, Rosahl, A, Mueller-Wiefel, DE, and Dötsch, J (2012). Long-term follow-up after rituximab for steroid-dependent idiopathic nephrotic syndrome. Nephrol Dial Transplant. 27, 1910-1915. Sellier-Leclerc, AL, Baudouin, V, Kwon, T, Macher, MA, Guérin, V, Lapillonne, H, Deschênes, G, and Ulinski, T (2012). Rituximab in steroid-dependent idiopathic nephrotic syndrome in childhood--follow-up after CD19 recovery. Nephrol Dial Transplant. 27, 1083-1089. Tellier, S, Brochard, K, Garnier, A, Bandin, F, Llanas, B, Guigonis, V, Cailliez, M, Pietrement, C, Dunand, O, Nathanson, S, Bertholet-Thomas, A, Ichay, L, and Decramer, S (2013). Long-term outcome of children treated with rituximab for idiopathic nephrotic syndrome. Pediatr Nephrol. 28, 911-918. Kamei, K, Ogura, M, Sato, M, Sako, M, Iijima, K, and Ito, S (2016). Risk factors for relapse and long-term outcome in steroid-dependent nephrotic syndrome treated with rituximab. Pediatr Nephrol. 31, 89-95. Ravani, P, Ponticelli, A, Siciliano, C, Fornoni, A, Magnasco, A, Sica, F, Bodria, M, Caridi, G, Wei, C, Belingheri, M, Ghio, L, Merscher-Gomez, S, Edefonti, A, Pasini, A, Montini, G, Murtas, C, Wang, X, Muruve, D, Vaglio, A, Martorana, D, Pani, A, Scolari, F, Reiser, J, and Ghiggeri, GM (2013). Rituximab is a safe and effective long-term treatment for children with steroid and calcineurin inhibitor-dependent idiopathic nephrotic syndrome. Kidney Int. 84, 1025-1033. Kimata, T, Hasui, M, Kino, J, Kitao, T, Yamanouchi, S, Tsuji, S, and Kaneko, K (2013). Novel use of rituximab for steroid-dependent nephrotic syndrome in children. Am J Nephrol. 38, 483-488. Iijima, K, Sako, M, and Nozu, K (2017). Rituximab for nephrotic syndrome in children. Clin Exp Nephrol. 21, 193-202. Safdar, OY, Aboualhameael, A, and Kari, JA (2014). Rituximab for troublesome cases of childhood nephrotic syndrome. World J Clin Pediatr. 3, 69-75. Lee, J, Chang, HJ, Lee, ST, Kang, HG, Ha, IS, and Cheong, HI (2012). Kikuchi-Fujimoto disease, a possible complication of rituximab treatment. J Korean Soc Pediatr Nephrol. 16, 138-141. Ahn, YH, Kang, HG, Lee, JM, Choi, HJ, Ha, IS, and Cheong, HI (2014). Development of antirituximab antibodies in children with nephrotic syndrome. Pediatr Nephrol. 29, 1461-1464. Ito, S, Kamei, K, Ogura, M, Sato, M, Fujimaru, T, Ishikawa, T, Udagawa, T, and Iijima, K (2011). Maintenance therapy with mycophe-nolate mofetil after rituximab in pediatric patients with steroid-dependent nephrotic syndrome. Pediatr Nephrol. 26, 1823-1828. Fujinaga, S, Someya, T, Watanabe, T, Ito, A, Ohtomo, Y, Shimizu, T, and Kaneko, K (2013). Cyclosporine versus mycophenolate mofetil for maintenance of remission of steroid-dependent nephrotic syndrome after a single infusion of rituximab. Eur J Pediatr. 172, 513-518. Andersen, RF, Thrane, N, Noergaard, K, Rytter, L, Jespersen, B, and Rittig, S (2010). Early age at debut is a predictor of steroid-dependent and frequent relapsing nephrotic syndrome. Pediatr Nephrol. 25, 1299-1304.